Himachal Pradesh RTC recruitment section given the notification of HRTC Driver Recruitment 2019. In the HRTC Recruitment, 176 Driver Vacancy are getting occupied with the 10th passed and driving license having candidates. Download www.hrtchp.com Offline Application Form Driver posts for posting it to the office address on or before 1st Feb 2019. The HRTC Driver Applications received after 1st Feb 2019 are not considered for the skill test. Offline Application of HRTC Driver Recruitment 2019 can find at our page along with the details. Recent HRTC Recruitment 2019 is open for the job seekers who have the minimum qualification of 10th class. In concerned with the filling of 176 Driver Vacancy in Himachal Pradesh RTC board, the new job advertisement is propagated in all the online job portals. The form of application submission of this HRTC Driver Recruitment 2019 is through the normal post method only. Candidates mainly own the educational qualification of the 10th class, minimum of 3 years experience in the driving and valid driving license applications for the Himachal Driver Posts. One who is owning all these qualifications, without waiting for any confirmation download the Himachal Pradesh Driver Offline Form. The pdf link that gives the way of downloading the application is given below. 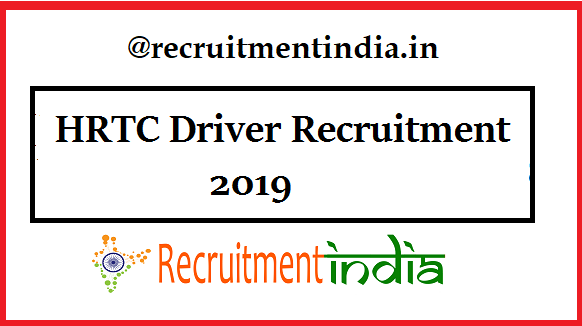 Himachal Road Transport Corporation (HRTC) in view of the Driver vacancy filling opinion released this HRTC Driver Recruitment 2019. So now it is the work of the job searching candidates to get the job in the Trasport organization of Himachal Pradesh. HRTC Driver Selection Process is not much complex. Academic marks and your driving talent will fetch you this job. With this point is it clear for the candidates that no separate preparation is not at all necessary after applying the HRTC Recruitment 2019. What talent you have while posting the application form just improvise it by practicing. Within the Himachal Driver form, eligible ones have to give the true details regarding the academic qualification or marks, driving knowledge, date of birth etc. The xerox copies of the educational certificates driving license are attested to the filled form hence fake details in the form can easily get caught by the recruitment board. HRTC Recruitment 2019 application submitting candidates have to check the educational qualifications given below. so minimum age is 18 years. Maximum Age is 45 years. Himachal Road Transport Corporation (HRTC) board selects candidates for the Driver Posts after conducting the following selection process. All 10th class qualified candidates with a valid driving license can enroll for this HRTC Recruitment 2019 by filling the application form. Application Fees Amount: Rs.200 through DD/IPO. Even though the Himachal Driver Vacancy count is 176 but the highest probability is there to get this job. Employment seeking candidates would not step back from this recruitment if you clearly have the educational qualifications. Nowadays joining in a job is not an easy one, among you some of the candidates sincerely want this job but they could not due to not matching the HRTC Recruitment eligibility criteria. Therefore, qualified postulants in view of the requirements from the board participate in the application sending process. Fortunately in response to your application form if you get the call letter of skill test attempt the test. Himachal Pradesh Driver Vacancy full details addressed over this page. Don’t search for the HRTC Driver Application Form online. It will not obtain because the recruitment board chooses the offline application receiving the procedure. Hence postulants will get it in the Himachal Driver Notification only. Recruitmentindia.in separate the notification and details filling the form in view of the candidate’s comfort. Only the pdf of Himachal Pradesh Driver Offline [email protected] is downloaded when the candidates clicked the link of “Application Form” given below. Write all your specifications exactly true. In the end of the form, give your signature. In the envelope of the properly filled form, along with the form attest the xerox copies of the 10th class certificate, driving license xerox. All your information must be clearly visible in the xerox copies. HRTC Driver Recruitment offline form receiving the last date is 1st Feb 2019.